One from the diaspora: O’Leary Walker Cabernet Malbec. We’re getting really topical today, with the talk of giving the vast Irish diaspora a vote in the general election we decided to raid the shelves for an interesting Irish conection wine. Now many of you are familiar with our good friends David O’Leary (not the footballer) and Nick Walker, the two driving forces behind the eponymous O’Leary Walker Wines, but todays wine is a new one to their stable. It has more conections to Ireland beyond David’s surname as the wine is produced in the Clare valley named after the Banner county. Anyway on to the wine. The two varieties are sourced from two sub regions within the Clare Valley. The Cabernet Sauvignon is organically certified from the ‘Doctor’s block’, located in the Polish Hill River Region, a superior cool climate vineyard which is dry grown and low yielding. The Malbec is from the O’Leary Walker Wines winery block situated in Watervale. The two varieties are fermented seperately then racked to oak barrels (25% new French oak; 75% two-three year old oak) for a total of two years. Incredibly perfumed with red forest fruits, sweet cassis and intense florals. This powerful blend is textural and concentrated with generous flavours. The gorgeous florals follow on to the palate with juicy tannins and acid length. This elegant style of Cabernet Sauvignon is complemented by the dusty tannin structure of Malbec. Classic forest fruits and intensity of oak. Pair with fresh Easter lamb or some nice fillet steaks. Along with Chardonnay, Riesling is considered to be one of the finest white grapes in the world, producing a whole range of styles from bone dry to lusciously sweet. The best wines are incredibly long-lived, elegant and racy. They become increasingly complex with age. Riesling originated in Germany where, along with neighbouring Alsace, some of its greatest wines are still made. It is also hugely popular in Australia and Washington. 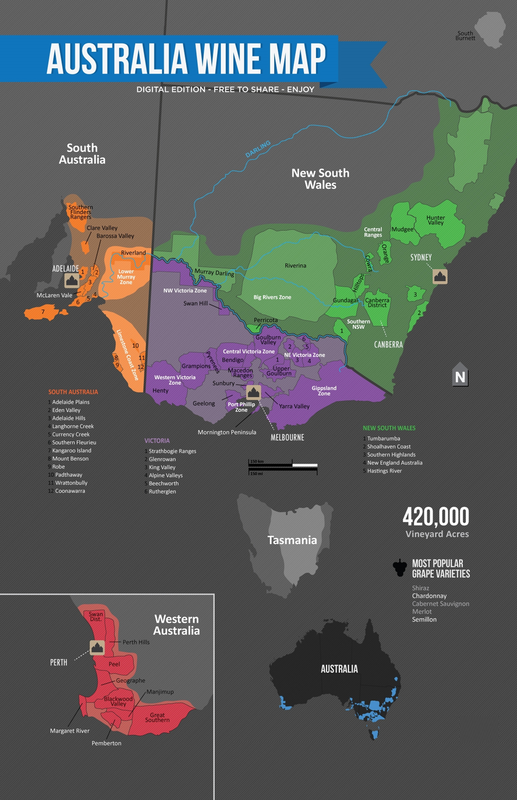 Interestingly, there is more Riesling planted in Australia than in France. Much of it was cultivated by Silesian settlers to South Australia. Subsequently, Riesling has become the go-to wine of the Clare and Eden Valleys with many old ungrafted vineyards. Names such as Pewsey Vale, Petaluma, Grosset and our very own O’Leary Walker resonate among those seeking a mineral edge to their dry white wine. These Rieslings retain acidity due to cool night-time temperatures, while exhibiting aromas of lime and citrus marmalade, with age. Riesling also performs admirably in other cool climate regions of Australia. These include the delicately fine Rieslings of Freycinet in Tasmania, and crisp tight styles of Orange. Peter Logan’s Weemala range goes from strength to strength. This Riesling is an exciting indicator of what the Orange region is capable of and if you’ve not boarded the Riesling train, you should definitely get a ticket, as this variety is going places. It shows lifted aromas of orange blossom and citrus while the palate rewards with a burst of apple and lime, a touch of sweetness culminating with zesty acidity. It’s a perfect candidate for fresh seafood or spicy Asian Cuisine. Slate subsoil and local terroir combine to produce a wine with more finesse less fullness at the front palate tighter in youth with varied scents from mineral to citrus pith steely palate texture with natural restraint and dry crispness and building along the tongue to reach its peak at the back. Will grow in the bottle with a lemon citrus intensity.